Place all oreos in a plastic bag and use a rolling pin until finely crushed. Combine oreos with cream cheese in a bowl and combine with the back of a large spoon. Chill for 15 minutes. Use a cookie scoop to create 1-inch diameter balls of the mixture. Chill balls for 30 minutes. When ready to decorate, melt white chocolate in a double boiler. Either dip only the tops of the balls in the chocolate or cover completely. 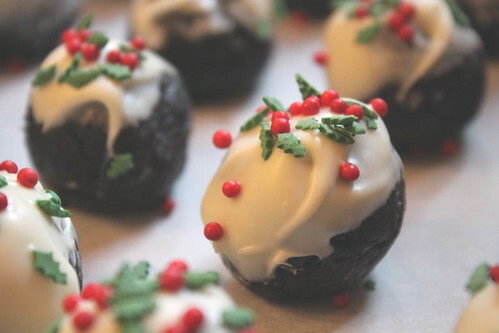 Before the chocolate hardens, sprinkle with holiday sprinkles.